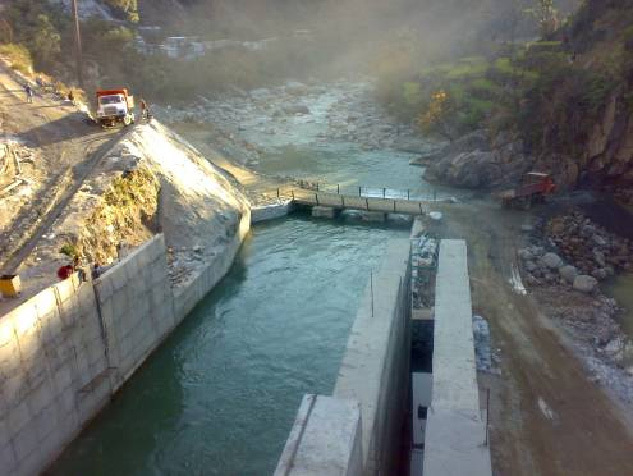 The project is located at Tehri Garhwal Distt. of Uttrakhand at an elevation of 1000m from MSL. 2. Intake structure with stop log gates , intake service gates and trash rack screen and Hoist. 3. Bottom outlet structure having stop log gates, intake service gates and trash rack screen and Hoist. 4. Inter-connecting tunnel of 4 Mtr. Dia horse shoe intake tunnel. 7. MS pipe completely encased by concrete, joining HRT-1 & HRT-2. 8. Surge Shaft: Vertical, eccentric type with gate Hoist. Under ground tunnel work has passed through almost 70% of poor Himalayan rock strata and supported by steel ribs. Complete tunnel is concrete lined of225 mm thick. The challenging task was to complete 187 Mtr. Long desilting chamber having 40 Mtr. upstream and 40 mtr. downstream transition in I:2 gradiant. The entire desilting chamber has passed through very poor rock strata which was supported with 250 mm ISMB steel ribs from crown to invert. Project : Detailed Engineering, Manufacturing, Supply, Supervision,Erection, Testing, Commissioning and Putting into Commercial use of Pump - Turbine, Generator - Motor & Associated Equipments for Koyna Left Bank Power Station (2x40 MW) (Association with Litostroj Power, DOO for Supply of Turbines). Client : : Hydro Projects, Water Resources Department, Mumbai. The scope of supply and services, will comprise mainly Design, manufacture, testing at manufacturers works before dispatch, comprehensive insurance upto completion of trial operation period, transportation, customs clearance inland transportation upto project site, supervision, on- site erection, testing, commissioning, putting into commercial use and giving a satisfactory trial operation for a period of 90 days of generating plant and equipment. Two Nos. : Vertical shaft reversible Deriaz or any suitable reversible Pump-Turbines each rated at 40,000 kW at rated head of 56 m., complete with governors, all auxiliaries and ancillary equipments. Two Sets : Penstock specials and pipes. Lot : Common station auxiliary equipments consisting of blow-down compressed air system, cooling water system, the power station drainage water system and draft tube/tail race dewatering system. Lot :- Mandatory Spares for mechanical lot. Lot : Special tools and plants for erection, testing and commissioning. Two Nos. : Vertical shaft water wheel generator-motor suitable for direct coupling to above turbines. Each Generator shall be rated at 44440 kVA having generation voltage 11.0 kV (Tentative) and complete with AVR, static excitation system etc. Two Sets : Isolated phase busduct. Two Sets : Generation voltage switchgear. Two Sets : Static protective gear. Lot : Static Frequency Converter (SFC) equipment for starting the units in the pumping mode. Lot : Supervisory Control and Data Acquisition system (SCADA). Lot : Mandatory Spares for electrical lot.